It will be two years before a deepwater offshore wind turbine appears near the remote midcoast island of Monhegan, but already researchers and island residents are getting ready for the changes it might bring. Environmental scientists have set up bird radar arrays on Monhegan, deployed underwater microphones and cameras around the island, and begun analyzing data collected during earlier environmental studies. At the University of Maine in Orono, small-scale wind turbines less than 10 feet tall are being tested so that mid-scale prototypes can be developed for research off the island’s southern shore. Meanwhile, island residents are anticipating what kind of effect offshore wind power development could have on the island’s economy — be it on the island’s status as a tourist destination, its fishing community or its precarious electrical system. In terms of the potential financial effect of offshore wind power development, state and federal officials have generally indicated that large deepwater wind farms in the Gulf of Maine could have significant economic implications for the state and its residents. Already, millions of dollars in research funds have been allocated to offshore wind turbine studies in Maine. The development of as many as 1,000 offshore turbines in the gulf, which could generate a total of 5 gigawatts of electricity, eventually could bring $20 billion in investment and several thousand new jobs to Maine by 2030, officials have said. But aside from the economic predictions, the possibility of offshore wind power development in the state raises many other questions that have yet to be answered. Monhegan is where answers to at least some of these questions will take shape over the next few years. Monhegan and the uninhabited islands of Damariscove and Boon are the three remote Maine islands whose waters have been chosen by the state for offshore wind power research. Among the information that researchers need to determine: How will the turbines float? How will they be anchored in place? How will they affect birds and bats? How will they affect marine life? How can they be designed to withstand stormy weather? What kind of effect will turbines have on the lives of nearby residents? To help answer many of those questions, Peter Jumars, director of the University of Maine’s School of Marine Sciences, has been busy lining up environmental science researchers for the university’s DeepCWind consortium project, which consists of more than three dozen universities, government agencies, private companies and nonprofit organizations. The consortium was formed last year to compete for research funds and to design and develop deepwater offshore wind turbines. Many of the environmental scientists participating in the project began collecting data on and around Monhegan earlier this summer, Jumars said recently. Some already had research projects in place before offshore wind development in Maine became a prominent issue, he said. Others have been enlisted specifically to see how the presence of a 120-foot tall turbine off the island’s southern coast might affect the environment around it. The test turbine is expected to be deployed in July 2012. In July, researchers with the New Jersey Audubon Society chartered a barge to transport a trailered radar monitoring system out to Monhegan to begin documenting the presence of birds and bats off the island’s southern shore. 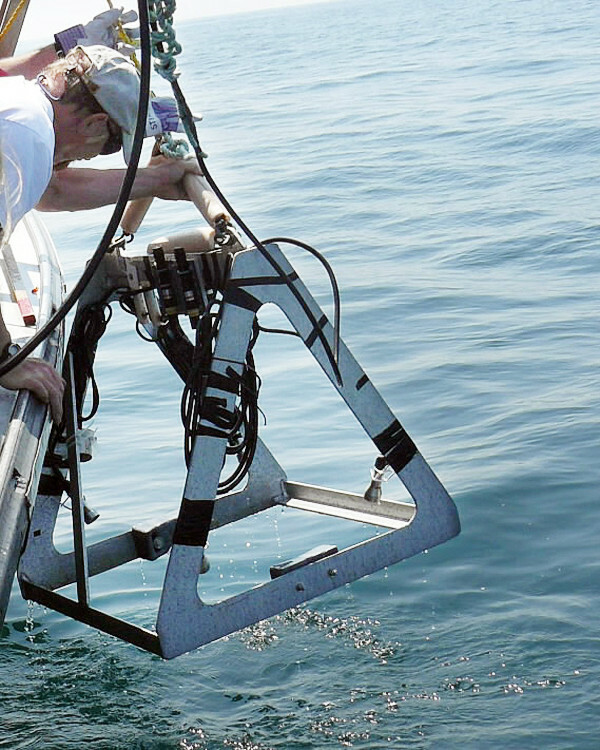 Around the same time, scientists with the Gulf of Maine Research Institute began collecting underwater acoustic and video samples from the surrounding waters to try to document the varieties of ocean bottom around the island and the presence of fish in the water column. Researchers also are using data from tracking studies and other fish surveys to try to determine whether endangered species such as Atlantic salmon, short-nosed sturgeon or right whales and commercial species such as lobster might be affected, according to Jumars. Heather Deese, marine programs director for the Rockland-based Island Institute, is helping to coordinate the coastal research projects connected with the consortium project. She said recently that beyond studying the presence of birds, bats and marine species, researchers also are conducting a sociological survey on Monhegan and in the coastal communities near the island, roughly between Boothbay Harbor and Rockland, of the attitudes toward and perceptions of offshore wind power development. Deese said that on Monhegan and elsewhere, there has been a variety of reactions to the idea of erecting wind farms out in the Gulf of Maine, running from the enthusiastic to the pessimistic. “I don’t think there is a universal reaction one way or the other,” Deese said. According to Jumars, scientists hope to compare data recorded this summer and fall with data they collect after a 120-foot prototype turbine is placed at the test site, about three miles off the island’s southern coast in water approximately 300 feet deep. Once the prototype is deployed, researchers will continue to collect data from the test site and from other sites so they can gauge whether any changes they detect might be attributed to the presence of the turbine, he said. The 120-foot-tall turbine will be roughly one-third the size of turbines that eventually would be deployed about 20 to 50 miles offshore in water hundreds of feet deep. “It’s an opportunity for us to see if there are any show-stoppers environmentally before we get a full-scale turbine out there,” Jumars said. He said the amount of information scientists can glean from a third-scale prototype is limited. Because it will be lighter and smaller, strong winds and large waves will affect it differently than they will a larger turbine, he said. “A third-scale model will bounce around a lot more [in heavy seas] than a full-scale model,” Jumars said. Scientists have yet to decide what kind of research might be done in 2011, a year before the test turbine is deployed. Because the ocean bottom off Maine’s coast quickly drops to depths of hundreds of feet, offshore wind turbines cannot be fastened to the bottom in the same way as turbines in more shallow waters off Cape Cod, Rhode Island or Europe. 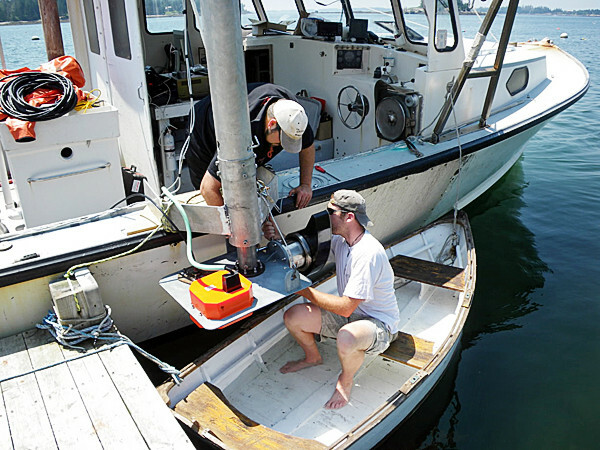 For that reason, consortium scientists are researching three different buoyancy systems for keeping turbines in position above the water’s surface, according to Bob Lindyberg, UMaine’s program manager for the consortium project. One method involves a large vertically floating pylon, or spar, that is weighted so the turbine mounted on top remains upright and stable in the water, he said recently. Another system keeps the floating turbine stable by mooring it to the ocean bottom with three taut mooring lines that prevent it from moving. The third would involve the use of ballasted seawater in an underwater barge to keep the turbine from tilting or bobbing up and down. In all three designs, the turbine would be moored by cables to the ocean bottom to prevent it from drifting with the seas, he said. 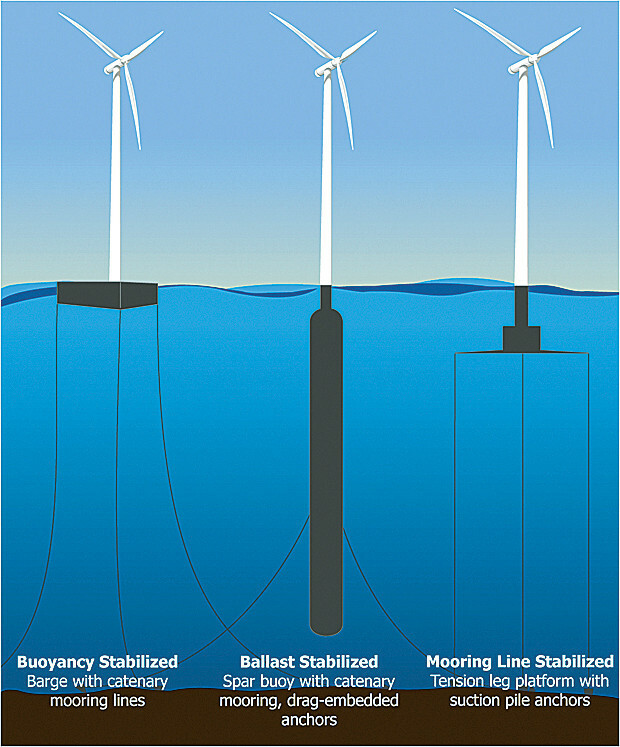 Each system is designed to keep the turbine at a fixed height above the ocean bottom in order to minimize the effect of passing waves. Because wind turbines become less productive if they are placed too close together, each turbine will have its own separate flotation system, according to Lindyberg. The space between neighboring turbines will be too great to place more than one on a single flotation device. “You really want only one tower coming off a platform,” Lindyberg said. Lindyberg said it is more practical to put large turbines offshore for several reasons. The wind resources are stronger out in the Gulf of Maine than they are on land, he said, and there is more room to erect and operate the turbines. There are few locations on land, where winds tend to be stronger at higher elevations, where there is room to maneuver and then erect a 3- or 5-megawatt turbine, which can be more than 500 feet tall. By comparison, the Penobscot Narrows Bridge between Prospect and Verona Island is 447 feet tall. “Out on the water, you can move around large pieces much easier than you can on top of a mountain,” Lindyberg said. At UMaine, he said, researchers can test turbine blades up to 70 meters or 230 feet in length. In addition, the economies of scale apply to turbine development, according to Lindyberg. It is more cost-effective to generate more power with fewer larger turbines than it is to try to generate the same amount of power with more smaller turbines. “It helps if you can put as large a turbine on the project [as you can],” he said. With a spar design, a turbine platform extends farther below the water’s surface than the tower and blades extend up in the air, he said. Still, even with large turbines, water depth should not be an issue for spar flotation systems. “There are plenty of places to do that 20 miles offshore,” Lindyberg said. Consortium engineers also are studying how to make offshore wind turbines lighter, he said, in order to reduce the need for flotation and to make them more stable. Lindyberg said that one reason for deploying a third-scale turbine is so it can be storm-tested with smaller waves. Powerful storms that generate wave heights of around 10 or 11 meters historically have happened once every 50 years or so, he said, and researchers can’t wait that long to see how a turbine fares in such extreme conditions. With a smaller model, waves that are 5 meters high can create the same relative conditions that a 50-year storm wave would create for a full-scale turbine, he said. Smaller storms that generate waves between 3 and 5 meters occur in the Gulf of Maine every few months. “We can put a third-scale model out there and see [smaller] waves that simulate storm events,” Lindyberg said. Undersea cables already are in use at other Maine islands that are connected to the mainland grid, according to Lindyberg, so there is no need to spend time researching how to transfer the wind-generated electricity to land. According to Jumars, regardless of which type of flotation system is used, the turbines are expected to have at least one immediate effect on fish. There is a phenomenon known as “the reef effect,” in which pelagic fish species are attracted to large floating objects that they use as shelter. Mathew Thomson thinks so. Thomson, a fisherman who has lived on the island for 17 years, said he thinks the benefits of generating electricity from the wind would offset any negative effects. “I don’t care where they go. Just put them up,” Thomson said recently about the turbines. Thomson acknowledged that some people have predicted vibrations from turbines in the water could drive fish or lobster away, but he’s skeptical that would happen. Like Jumars, he said structures in the water often attract fish, serving as artificial reefs. This has been known to happen with oil rigs in the Gulf of Mexico, which he said generate noise and vibrations during their normal operations. Monhegan has a reputation for being very protective of the island’s natural landscape and for the past 50-plus years has had a land trust, Monhegan Associates, in place to help maintain the island’s forests and trails. Doug Boynton, a local fisherman who also is a Monhegan Associates trustee, said recently that the trust is not overly concerned that offshore wind power development will have an adverse effect on the island’s beauty or resources. The presence of the prototype three miles off the island’s southern shore will be temporary, he said, and any permanent placement of larger turbines will be well out to sea. The benefits of tapping into renewable energy and the possibility that Monhegan may have access to the electricity generated by the turbines make the project appealing, he said. Monhegan residents who are skeptical about the benefits of offshore wind power development could not be tracked down for this story. But according to Ron Huber of Rockland-based Penobscot Bay Watch, which also has been vocal in its criticisms of state plans to develop part of Sears Island, there are several ways that offshore wind turbines could have an adverse effect on the environment and nearby residents, especially if they are placed close to shore. Huber said recently that turbines likely will result in fishing grounds being closed and could affect the presence of marine species in the area. The turbines could affect nearby wind patterns, he said, which might affect the distribution of lobster larvae that drift in the ocean’s currents. The turbines could affect birds that appear in the skies near Monhegan, according to Huber, and could create fog by affecting air pressure around the turbines, which could draw deep cooler water up to the ocean’s surface. Huber said he is concerned that, despite the state’s expressed interest in locating wind farms far offshore, turbines could end up being closer to land. 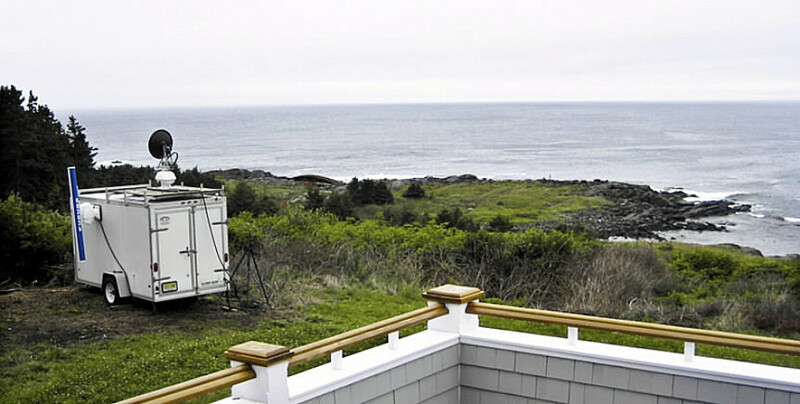 If they are, noise would be an issue for nearby residents, he said, and the presence of a testing site near Monhegan could affect the island’s status as a summer destination for landscape painters. Locating turbines many miles away from land, where there are fewer animals and where humans tend not to go, makes more sense, he said. Besides being a fisherman, Mathew Thomson also serves as chairman of the island’s power district. If the island were able to tap into an offshore wind farm, he said, it could help boost the availability and reduce the cost of power on the island. Monhegan’s power now is produced by diesel generators and distributed by a hodgepodge system of wires, according to Thomson. Because of the cost of importing diesel fuel from the mainland and maintaining the island’s grid, Monhegan’s 70 or so power customers pay 70 cents per kilowatt-hour, he said, about 10 times what it costs most residential customers on the mainland. The volatility of the price of oil in recent years has given many island residents on Monhegan and elsewhere a greater sense of urgency about finding new sources of energy. To try to keep power bills down to reduce the load on the island’s grid, many residents use propane refrigerators or hang their laundry to dry, according to Thomson. He said he powers two freezers and a “handful” of lights, but still his electric bill comes out to about $230 a month. According to Thomson, the island’s power district has considered installing its own turbines on the island but probably can’t afford it. A large, commercial-scale wind turbine can cost more than $1 million, he said, and unless the district installed an underwater cable to the mainland, it would have no way to generate revenue by selling off excess power the turbine would generate in the winter, when the island population dips and wind speeds increase. At $1 million per mile, just installing the underwater cable likely would cost the district at least $10 million. Undersea cables are not expected to be cost-prohibitive to offshore wind developers. Thomson said whether the island would be able to tap into an offshore wind farm is “wild speculation,” and that cheaper and more available power isn’t the answer to making life easier on Monhegan. The island’s school will have only two students this winter, he said, and jobs are hard enough to find on other islands that have better energy availability and cost, not to mention in the rest of Maine. But it would be a step in the right direction, he said. More information about the research project is available on the Internet at http://deepcwind.org/.